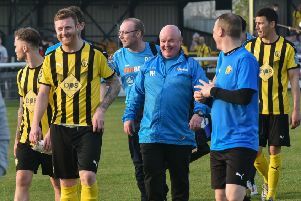 Paul Holleran still believes Leamington are good enough to make the play-offs despite their poor form. Leamington boss Paul Holleran knows the pressure is on heading into tomorrow’s derby encounter with Stratford but said he would not expect it any other way. A 2-0 defeat at Bedworth United on Boxing Day extended Brakes’ winless sequence to four games, dropping them to a season-low eighth in the process. And, having led the Southern Premier League earlier in the season, the fall from grace has led to speculation that Holleran’s six-year spell in charge at the New Windmill could be coming to an end. “The pressure is always on when you’re not winning games,” admitted Holleran. “We all know that with a full squad we’re good enough to challenge. We’ve said that from the word go. “We got off to a good start but the last month has been disappointing. He added: “Disappointing as it has been, I’ve got to back the players to come through it. “One or two are trying too hard and trying too much and one or two need to step up to the plate. Because if the results continue as they are, there will be changes. Stratford sit six points behind Brakes after adapting well to their new surroundings following promotion. However, Holleran says it is a game the hosts simply must win. “We know where we want to be and feel we have got a squad to make the play-offs. Ben Mackey is set to return tomorrow after sitting out the defeat on Bedworth’s 4G pitch with a stiff back. Jack Edwards is also back after suspension.